Pamplin Media Group - A monarch movement at Mary S. Young? A monarch movement at Mary S. Young? 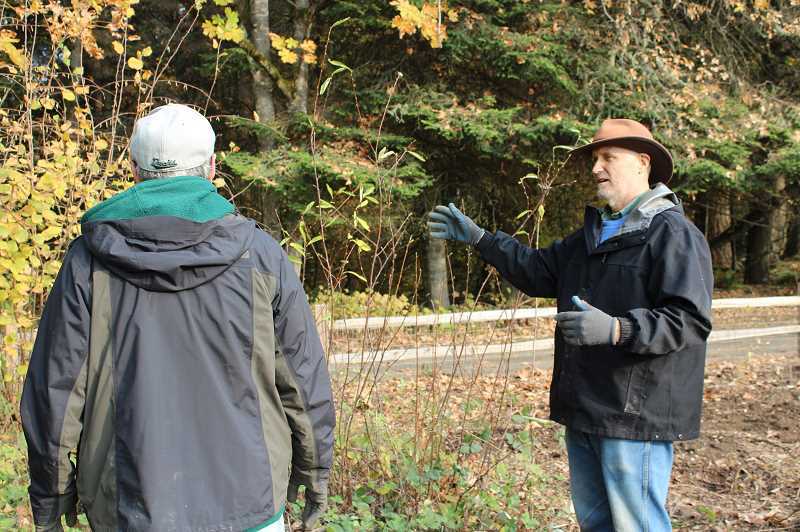 About two years ago, West Linn Parks and Recreation Director Ken Worcester called a meeting at his office with a couple park volunteers and Scott Black, the executive director of the Xerces Society for Invertebrate Conservation. Worcester knew the four men had a shared interest in attracting more pollinators to West Linn, and the park volunteers — Michael Rutten and Dave Kleinke — were especially interested in monarch butterflies. "It was a bunch of butterfly fanatics who all triangulated and ended up in a meeting together," Kleinke said. "As crazy as it sounds, we all had an interest in monarch butterflies; Ken called us together because he was the one person I think who was in common (between us). We all met in his office, and out of that came discussions between us and Xerces — 'Do you want a pollinator garden at the park?'" That park was Mary S. Young, and in recent weeks the West Linn Parks Department welcomed volunteers from a wide array of sources — the Xerces Society, OSU Master Gardeners, the Campfire program from Bolton and Cedaroak Park Primary Schools, West Linn High School, and community members like Kleinke, Rutten and Lorie Griffith — to chip into the formation of the garden. According to Griffith, the garden will include forest natives like snowberry, thimble berry, Oregon grape and fall asters, among several others. "This is a community garden — it's a pollinator garden filled with native plants," Griffith said. "There's just five pollinators we're trying to attract. It's the five Bs: butterflies, bees, beetles, birds and bats." The garden is located near the north side of the dog park, and while the group's original goal was to attract monarch butterflies specifically, it eventually decided to expand its reach. "When Scott Black, the Xerces executive director, met us out here and toured the park looking for a place, this (location) is what he suggested," Kleinke said. "He also suggested that we expand it to a pollinator garden versus just a monarch butterfly (garden). ... We're at the extreme edge of their (monarch butterflies') territory here in Portland." On a crisp and clear morning last Tuesday, students from a WLHS permaculture class gathered to plant native pollinators at the garden. "We did a little prepping by learning about the importance of pollinators within our system, and how important they are for basically every aspect of our food life," said Geoff Bingham, who teaches the permaculture class. "No matter where you eat on the food chain, you still need pollinators somewhere within that food chain to help it function." 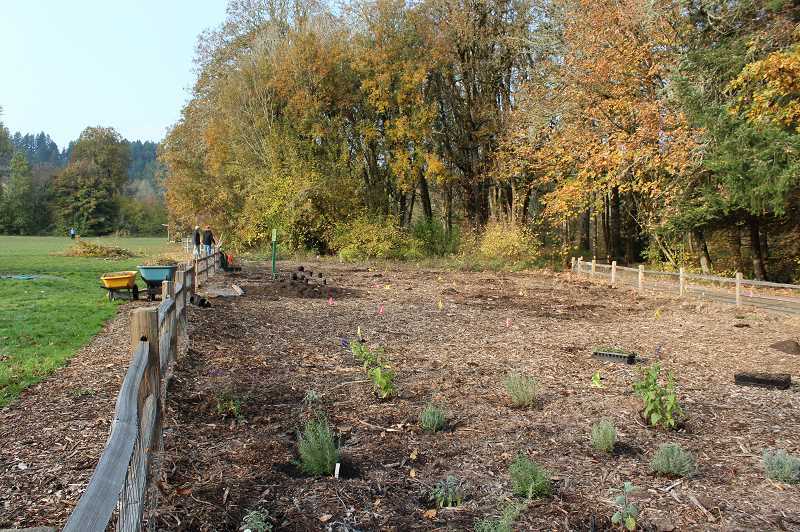 In recent years, the City has also installed "butterfly waystations" — areas with plants and foods that are specifically intended to draw butterflies — at Marylhurst Heights Park, and it is in the process of earning certification for the Backyard Habitat Program at that park. According to West Linn Recreation Coordinator Terri Jones, the parks department is also pursuing West Linn's certification as a "Bee City USA." According to its website, the Bee City USA organization "fosters ongoing dialogue in urban areas to raise awareness of the role pollinators play in our communities," and Bee Cities must agree to a set of commitments that help create sustainable habitats for pollinators. Nearby Wilsonville is one of seven Bee Cities in Oregon. "We are excited to move this forward, and believe there will be a lot of interest from the public going forward," Jones said. "Plant it and they will come," Rutten said.